There are two pocket parks in Towcester. Both sites are under the ownership of the Town Council. Nicholas Hawksmoor Pocket Park is located between Nicholas Hawksmoor Primary School and the Riverside Walk. It is open for the enjoyment of visitors every weekday. 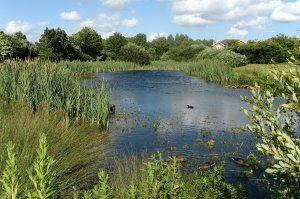 Tove Wetland Pocket Park is located adjacent to the Belle Baulk estate and is currently under development having successfully received funding to maintain and improve the bio-diversity of the area.